New York: Since December, 2017 Russia has cut its holdings of US foreign debt by more than half. Instead, it’s been increasing the share of gold in its international reserves. That’s understandable behaviour for a country that has to deal with an unpredictable US sanctions policy, but it’s also part of a trend. Foreign governments and international organisations account for a decreasing share of outstanding US debt, and some economies have in recent years aggressively upped the share of gold in their reserves instead. The Russian reduction of Treasury holdings, to $48.7 billion (Dh178 billion) in April, 2018 from $102.2 billion in December, 2017, has been nothing short of dramatic, though it wasn’t a huge blow to the US. Russia’s holdings of American government bonds have long been dwarfed by those of China and Japan, as well as Brazil and some European countries. The US, with a debt of almost $21.2 trillion, can afford not to notice fluctuations in the tens of billions of dollars by an authoritarian state’s damage control efforts and attempts to get away from the dollar. The US can lull itself into a certain sense of security as it watches the foreign-owned stock of its debt securities increase in absolute terms and as the dollar slips only slowly as a share of official foreign exchange reserves. The US currency, according to the International Monetary Fund, made up 62.7 per cent of these reserves in the fourth quarter of 2017, down from 64.59 per cent in 2014 — but then the share of the next biggest reserve currency, the euro, has also dropped to 20.15 per cent from 21.57 per cent. This is hardly a tectonic shift. And yet the US does have a few things to worry about when it comes to its dominance of other countries’ official international reserves. In relative terms, governments and central banks are less and less interested in the ballooning US debt. US debt, of course, is growing faster than global international reserves, and that partly explains the declining role of foreign countries in keeping the US government solvent. On the other hand, there’s plenty of US debt to buy but countries aren’t keen to increase its share in their reserves. Instead, the share of US Treasury securities has gone down to 25.4 per cent currently from 28.1 per cent in 2008, while the share of gold has held steady at about 11 per cent over the same period, according to the World Gold Council. That’s in part thanks to the efforts of a few eccentric gold bug authoritarians. Apart from Russia, they include Belarus, Kazakhstan and, recently, Turkey, where President Recep Tayyip Erdogan believes the West is out to punish Turkey for his sovereignty-enhancing policies. Russia, Kazakhstan and Turkey account for 50 per cent of net gold purchases by central banks in the last five years. But large European economies, which have long kept most of their international reserves in gold, have mostly held its share steady rather than invest more in dollar-denominated assets. The Euro area, including the European Central Bank, holds 55 per cent of its total international reserves in gold, just like in 2008. Most recently, total demand for gold has been down. It dropped 7 per cent year-on-year in the first quarter of 2018 because of a drop in private investment demand (accordingly, the price of gold is down for the year). But central banks — primarily those of the gold bug authoritarian states — bought 116.5 tonnes of gold in the first three months of 2018, the most in any first quarter since 2014 and up 42 per cent year-on-year. For Turkey as for Russia, the decision to reduce holdings of Western currencies appears to be strategic. Like Russia, Turkey has recently moved quickly out of US debt, cutting holdings by almost 38 per cent to $38.2 billion since October, 2017. The reason more countries aren’t doing this, bothered as they may be by President Donald Trump’s economic policies, his trade wars, his isolationist rhetoric and the relatively weak US dollar, is that gold is performing even worse than the US currency. Reserve managers in most countries, Bradley Jones wrote in a recent International Monetary Fund working paper, are increasingly acting like private investors, seeking healthier returns. That means ideologically or geopolitically motivated moves into gold are not on the cards for most of them until the metal starts appreciating — perhaps in response to higher inflation, which investors have traditionally offset by purchasing gold. In the meantime, reserve managers are shopping for other non-dollar-denominated assets. The shares of all reserve currencies except the dollar in international foreign exchange reserves are up, if only very slightly, since Trump won the presidential election. That’s an extremely timid shift so far — but it shouldn’t deceive US policymakers. The US dominance of international reserves has held for nearly a century (the pound was the preferred currency before the dollar, and the French franc held the crown before it), but historically speaking, that’s a relatively brief period. It’s not a given that the world will keep buying US debt at the same levels regardless of American policies and the shifting perceptions of US political and economic power. 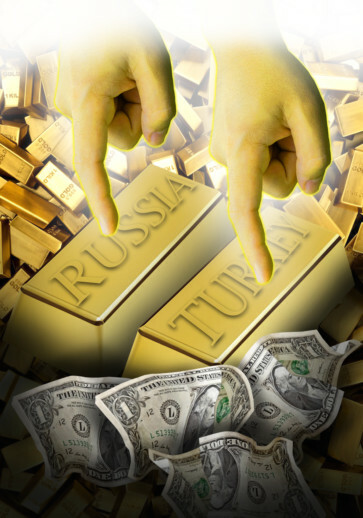 The Russian and Turkish flight into gold could be a precursor of bigger global shifts.